Western Sand Cherry is known for its unique, leathery grey-green foliage and beautiful white blossoms. 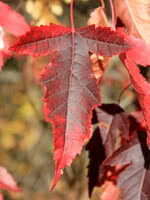 It is a popular ornamental shrub in parks and front yards. 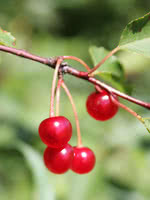 Both you and the wildlife will love its edible small dark red to purple cherries. Due to its small stature and spreading qualities, Western Sandcherry is suitable as an underplanting or groundcover. 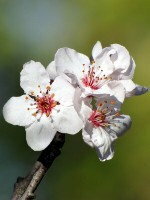 Many people graft plum and cherry varieties to Western Sand Cherry and use it as rootstock. It is also popular to graft hardy apricots to. Greenhouse grown container seedlings transplanted into our bareroot fields for a second growing season. These trees are better branched and more robust than container stock. Greenhouse-grown, true to type and vigorous. Sorted for size and form. This prairie seed source has a tendency to be a bit more upright than spreading. 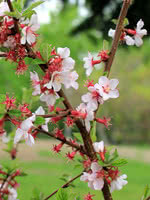 Popular as a rootstock for plums or as an ornamental shrub.